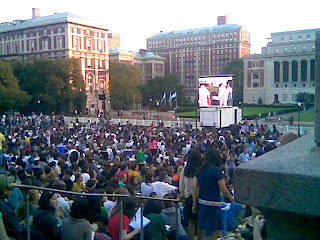 Once in a while big things happen on the university campus (where i have studied and now work for 5 yrs) that makes one realize the perks of being at Columbia University. 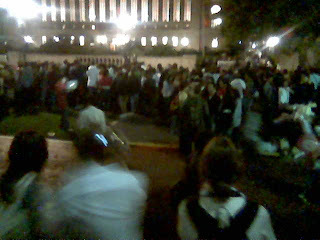 In the last 5 yrs, i have seen many top international leaders come and talk to the students here, such as vladimir putin, the former Indian prime minister Vajpayee, billionaires like Mark Cuban, Nobel Prize Winners like Amartya Sen. And then one was there during the highly exciting and controversial speech of the the iranian president Mahmoud Ahmadinejad in 07. Tonight was among the bigger nights. The excitement hadd been building on for days. The university had to do a lottery to select the lucky few hundred students who would actually watch the event live. The university servers went down because they couldnt handle the traffic - so many students were refreshing the pages so as to be the lucky one to get the lottery. The occassion merited it -Both McCain and Obama to speak at the university about the importance of national service on the occassion of 9/11. And though i was not eligible for the lottery (not a student technically but a staff member) , i was as excited as the others. The Scene by 7pm - more and more packed !! 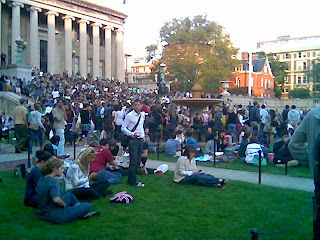 By 7.30 pm the area had gotten packed - every inch of the library steps was taken up and the surrounding grass patches were occupied. And what a night for a historic event - clear skies, the high rising moon and the freshest of fall breeze. And the strong scent and vibe of the idealism and optimism of youth. Needless to say, barring a handful, every one was an Obama supporter. Barring the techincal glitches (yeah the broadcast signal sucked and was down regularly. 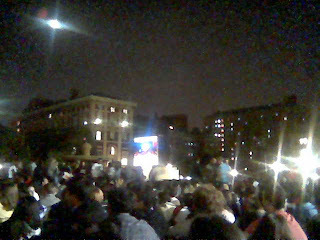 we all were not inside the main auditorium - just outside watching the whole thing on giant screens. but the experience was probably better). The event was fun. Plenty of boos for the obviously boring McCain statements (well he has won some points for this bold move of selecting Sarah Palin, but thats about it). The loudest of cheers were for obama's inspiring words. But the loudest of loudest cheers were reserved for moments when Obama mentioned Columbia, specially when he remembered the his own days at the university. Toby maguire did get his share of applause and so did Gov. Paterson and other speakers. A fantastic night. And one that reinforced that the current dip in poll votes for obama are just a temporary dip - after the palin fever subsides, it will be difficult for McCain to match Obama's shimmering persona, inspirational ability and well thought and fresh perspectives. Yes we can! Yes we will.